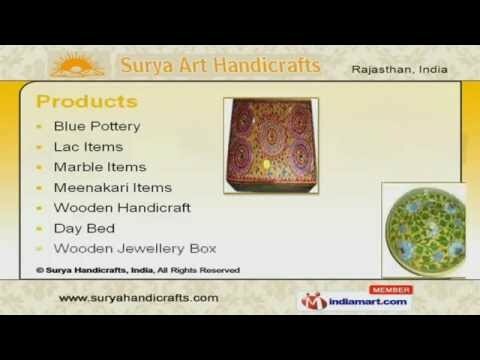 Welcome to Surya Art Handicrafts. Manufacturer & Exporter of Wooden, Brass Works & Gemstone Pictures. The company was established in the year of 2009. Our Ethical business policies & various Clients across the globe help us to establish a Strong foothold in the industry. Advanced technology, spacious warehouse facility & Team of skilled professionals are the factors that keep us a step ahead of our competitors. We offer a splendid range of Wooden Handicraft, Day Bed, Lac & Marble Items. Pottery Plates, Trays, Boxes & Tiles are available under Blue Pottery. Lac Mirror, Multi colored Lac Pill Box & Heart Lac Mirror offered by us are a class apart. Our Marble Items are widely appreciated for their features such as fine finishing and long lasting nature. We also provide Meenakari Items that are able to enhance the beauty of your interiors. Owing to the fine finishing, well-polishing and intricate designs, our wooden handicrafts are widely accepted by our clients based all over the world.